Between the chillier days and fighting off germs, I have developed a new morning (and sometimes nightly) routine. It’s the best. Basically, it’s a power house tea. And it’s my new favorite thing. 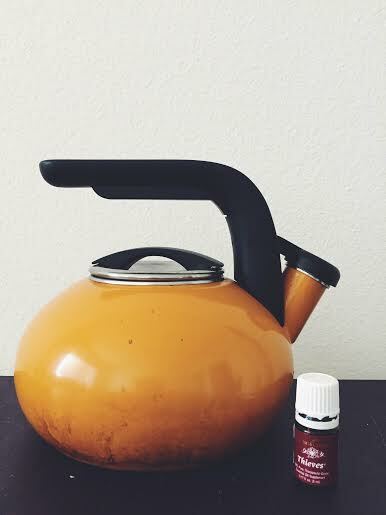 I simply heat up some water in the tea kettle, squeeze some lemon juice into a mug, add 2 drops of Thieves. I let it all “brew” for a minute or two and keep a spoon near by to give it a stir every so often, to keep the oil from lingering at the top. Now, hot water with lemon is already great by itself. It’s an awesome way to start the day and jump start your digestive system. But, due to the off and on stuffy nose I have woken up with, I decided to step up my game. Sometimes I even add a splash of fermented apple cider vinegar. You could even take it a step further and add some raw/local honey. Between this tea, liquid silver, monitoring my sugar intake (yes, even fruit) and incorporating fermented foods/beverages, I have thus far (knock on wood) kept any signs of sickness away. Neither of us have experienced any cold/flu/cough this wintery season . . . and we hope to keep it that way. Do you have any winter rituals? PS: We use the nasal spray version of Sovereign Silver. We have found it to produce the best results AND it lasts the longest (= more bang for your buck). I pick it up at Sprouts/Whole Foods for $14 and it lasts a good month if not longer (for preventative measures. If you’re already sick, you may use it up faster). This entry was posted in Uncategorized and tagged cold, essential oils, fermented foods, flu, flu season, Paleo, tea, winter, young living. Bookmark the permalink. Enter your email address to follow Weird Amphibians and receive recent posts via email.